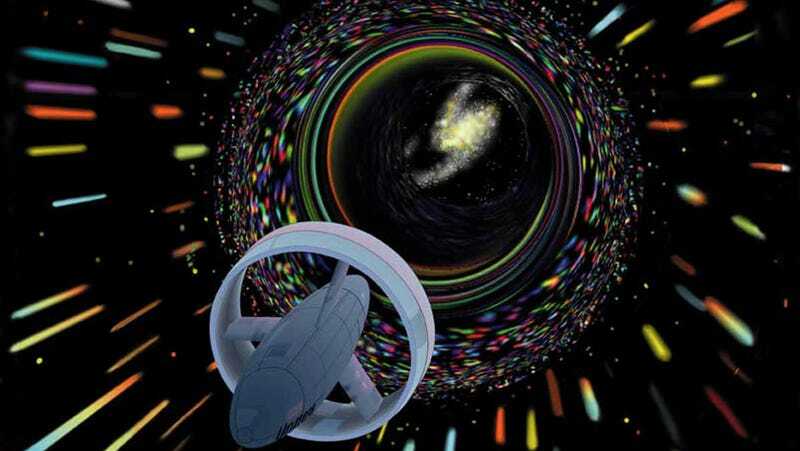 Wormhole travel envisioned by Les Bossinas for NASA. “It takes longer to get through these wormholes than to go directly, so they are not very useful for space travel,” [Harvard physicist Daniel] Jafferis said. He will present his findings at the 2019 American Physical Society April Meeting in Denver. Pop culture would have us believe that travel through a wormhole is pretty instantaneous—a shortcut between folds in the universe. That is, apparently, not actually the case. But don’t succumb to your disappointment just yet—these wormholes are actually thought to have a purpose beyond human travel. “The real import of this work is in its relation to the black hole information problem and the connections between gravity and quantum mechanics,” Jafferis said. To clarify, wormholes are going to be more important for black holes and quantum mechanics than they will be for travel. Jafferis’ theory states that wormholes can form between two black holes that connect at a quantum level. Light would be able to travel through the wormhole, and scientists could retrieve information about black holes from the transmission of light. That data would be cool and all—but if any scientist needs someone to actually go out and test wormhole travel, I would be a most willing participant.